Most of us have applied makeup on trains, in taxis, or out in public at one point or another. While the practice of applying makeup in public is reasonably common, there are still people who stop and stare. So, for CoverGirl’s newest campaign called #projectPDA (public display of application) they are teaming up with some of our favorite beauty influencers to start a conversation about why applying makeup in public should be no big deal, if that’s your bag. After all, why should applying a bold lipstick in public be looked at any differently than applying hand cream, or redoing a ponytail? Followers and makeup lovers are encouraged to post pictures, videos, or stories under the #projectPDA hashtag, sharing their experiences applying makeup in public. After surveying 1,500 women across the country, Covergirl found that over half of the women felt uncomfortable applying makeup in public. They’re hoping the campaign will help shift that. They got beauty vlogger Laura Lee to talk about why she thinks makeup application should be a free and celebrated activity. The lovely blogger Raye Boyce says if you love wearing it, there’s no reason to feel embarrassed. The popular vlogger Bri Hall says she prioritizes honesty, and sometimes the honest move is touching up in public. 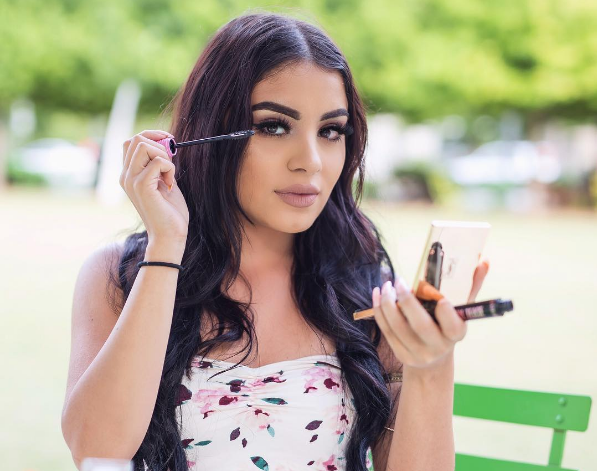 Beauty vlogger Thania Gonzalez, of Thania’s Beauty shares how she was shamed for doing makeup in a taxi, and that she hopes those attitudes fade away. The popular beauty personality Jade Kendle says that makeup and hair are self-expression, so why limit it to your home?! If you feel inclined, the next time you’re applying makeup on the bus you can snap a photo and add your own story to the #projectPDA hashtag.